Pool Decks, Patios, Walkways & More! 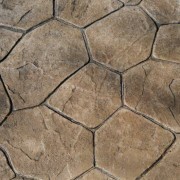 Stamped Concrete provides a beautiful, resilient surface for pool decks, patios, walkways, driveways and more! Select from a number of stamp designs including Verona, Cobblestone, Fieldstone, London Weave and many more! Customize the color of your finished job to highlight or contrast the color of your home and garden to add that personal touch! The front walk is beautiful! We have already had several compliments on it. Your work team was professional and accommodating, which we greatly appreciated. Donna and I want to take a moment to let you know how pleased we are with the walkway you recently poured at our home. It has added that special dimension to our entranceway. I remain impressed with how well you were able to color match the pad to the dry stone retaining wall we had installed prior to your arrival. It all looks so natural – just the way we hoped it would. Please accept my thanks on behalf of your crew as well. They were friendly, cooperative, and always willing to do whatever was needed to make everything just right. We are very pleased with the cobblestone look and have received many compliments from friends and neighbors. The product’s ease of maintenance, beauty of your workmanship and professional integrity were the reasons we chose your company. Aleria Custom Concrete is a trusted name in Connecticut’s concrete industry. Owner Frank Aleria has worked in the concrete field on large municipal projects as well as residential and commercial projects for over 20 years. 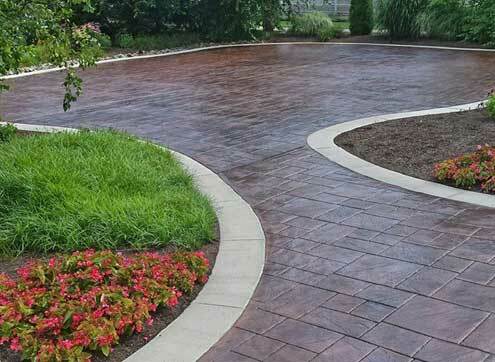 Frank is a creative and skilled craftsman and has become a leader and innovator in decorative concrete flatwork in the greater Hartford area. At Aleria Custom Concrete, we strive to make each project a true work of art. We explore and experiment with new ideas and techniques regularly. Learn more. If you click the checkbox we will add the email you entered above out our mailing list.